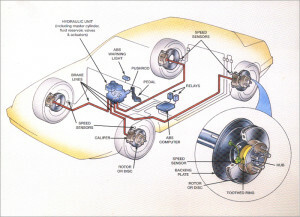 Anti-Lock Brake Systems (ABS)|Brandon, FL :: Scott's Automotive Inc.
An anti-lock braking system (ABS) is a safety system that allows the wheels on a motor vehicle to continue interacting tractively with the road surface as directed by driver steering inputs while braking, preventing the wheels from locking up (that is, ceasing rotation) and therefore avoiding skidding. An ABS generally offers improved vehicle control and decreases stopping distances on dry and slippery surfaces for many drivers; however, on loose surfaces like gravel or snow-covered pavement, an ABS can significantly increase braking distance, although still improving vehicle control. Since initial widespread use in production cars, anti-lock braking systems have evolved considerably. Recent versions not only prevent wheel lock under braking, but also electronically control the front-to-rear brake bias. This function, depending on its specific capabilities and implementation, is known as electronic brakeforce distribution (EBD), traction control system, emergency brake assist, or electronic stability control (ESC).